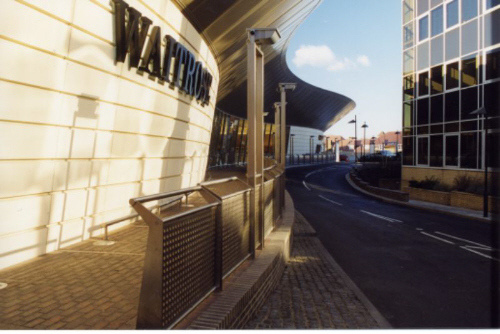 We have had a long association with Waitrose Ltd and have provided structural engineering services for a large number of stores. Often they are located on difficult sites where special enabling works and basements are required to maximize the potential of the site. 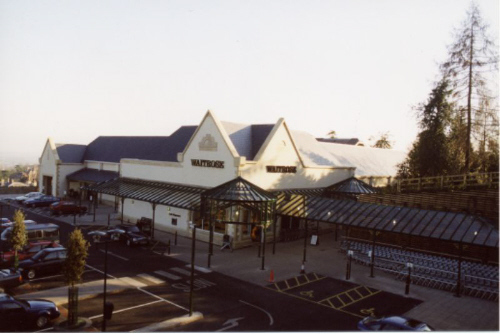 This new Waitrose supermarket lies in the heart of the pretty Worcestershire town of Malvern and involved substantial civil engineering works. Some 10,000m2 of hillside was excavated and relaid in a massive cut and fill operation to create a level platform for the two storey supermarket and car parking. The value of construction works was £9.4m and timber crib retaining walls up to 8.5m high were required. A complex project involving 'shoe horning' a full sized supermarket and two level car park onto an extremely confined site in the centre of this busy London suburb. In order to comply with planning requirements a basement was created to accommodate unloading facilities for heavy goods vehicles and a warehouse. A 15m diameter powered turntable was created at basement level to turn the HGVs. The sales floor above spans up to 24m over this area.